Be the first to share your favorite memory, photo or story of Ervin. This memorial page is dedicated for family, friends and future generations to celebrate the life of their loved one. 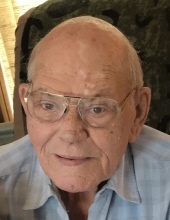 Ervin Frederick William Meyer passed away at St. Elizabeth’s Hospital in Lincoln, NE on April 6, 2019 at the age of 80 years, 6 months, 14 days. Ervin was born in Otoe, Nebraska on September 23, 1938 to Rudolph Carl and Minnie Sophie (Sporhase) Meyer. Ervin was baptized and later confirmed at St. John’s Lutheran Church in Otoe. Ervin attended school in Otoe and was the Salutatorian of the Otoe High School Class of 1956. In 1963, he was married in St. John’s Lutheran Church to Cecilia Kay Smutz. To this union, three daughters were born. Throughout his lifetime Ervin held a variety of different jobs. For many years he sold insurance and bartended at the VFW in Beatrice, NE. In the mid 80’s, he moved to Talmage and ran the Diamond bar. After that, he moved to Otoe, NE, worked for the Otoe County Department of Roads and at one time was the Mayor of Otoe. Before retirement, he moved to Nebraska City, NE and worked for the Nebraska Department of Roads for almost 20 years. In his spare time, he enjoyed hunting, fishing and outdoor activities. He was always up for a game of cards with family or friends. During the last several years he enjoyed time spent at the campground with his daughters. Passing before him were his parents and four brothers, Leonard, Norman, Ivan and Dennis. Left to mourn his passing are his daughters, Wendy Hamm of Nebraska City, Janice (Brad) Volker of Auburn and Dana Meyer of Omaha. His brothers, Wayne (Kathy) Meyer, Lynn (Cindy) Meyer all of Nebraska City, his sister Lois (Larry) Ikenberry of Palmyra and sister-in-law Ruby Meyer of Sun Lakes, AZ. Grandchildren Zachary (Liz) Volker, Dylan Volker, Jacob (Neshay) Volker, Taylor (Kyle) Amen and Wyatt Volker. Great Grandchildren Addison, Ciri, Harper, Elliott, Emersyn and Lennon. Many other nephews, nieces, relatives and friends. To plant a tree in memory of Ervin Frederick William Meyer, please visit our Tribute Store. "Email Address" would like to share the life celebration of Ervin Frederick William Meyer. Click on the "link" to go to share a favorite memory or leave a condolence message for the family.